Ninety-nine men entered the cold, dark tunnels of the Consolidation Coal Company’s No.9 Mine in Farmington, West Virginia, on November 20, 1968. Some were worried about the condition of the mine. It had too much coal dust, too much methane gas. They knew that either one could cause an explosion. What they did not know was that someone had intentionally disabled a safety alarm on one of the mine’s ventilation fans. That was a death sentence for most of the crew. The fan failed that morning, but the alarm did not sound. The lack of fresh air allowed methane gas to build up in the tunnels. A few moments before 5:30 a.m., the No.9 blew up. Some men died where they stood. Others lived but suffocated in the toxic fumes that filled the mine. Only twenty-one men escaped from the mountain. 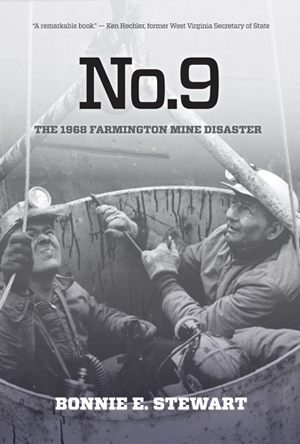 No.9: The 1968 Farmington Mine Disaster explains how such a thing could happen—how the coal company and federal and state officials failed to protect the seventy-eight men who died in the mountain. Based on public records and interviews with those who worked in the mine, No.9 describes the conditions underground before and after the disaster and the legal struggles of the miners’ widows to gain justice and transform coal mine safety legislation. Bonnie E. Stewart is an investigative reporter covering the environment for EarthFix at Oregon Public Broadcasting. Before moving to Portland, she taught journalism at West Virginia University, where she earned tenure and the rank of associate professor. She spent most of her reporting career at the Indianapolis News and the Indianapolis Star and reported in California for the Press-Enterprise in Riverside and was a copyeditor for the Business Journal Serving Greater Sacramento. She earned a master’s degree in English from California State University and earned a George Polk Award for metropolitan reporting and the National Society of Professional Journalists’ Sigma Delta Chi Award for Public Service.